I get up. Have a cup of green tea. Breakfast. Check my emails. Then get down and dirty with my RSS reader full of 1000+ new pieces of the internet. This is something I do every morning, it makes me happy. What do I need to make this happen? 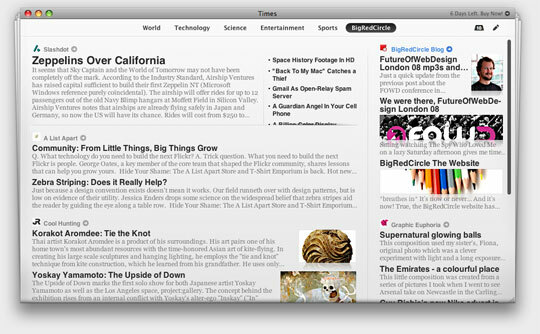 An RSS reader. Why am I telling you this? I have found something new. For the last year or so I have been into RSS feeds in a big way and almost everyday I use Google Reader to get my fix. For the last week I have been using something else. Something different, something unique, something strange but not unpleasant. As you can see Times is not your usual list/email style of feed reader. It presents you with an interface non too dissimilar to a newspaper. It has been exquisitely crafted and integrates well with OSX. Considering all of the information is dynamic and from different sources the visual layout is captivating and slick. Once my initial ooh’s and arrr’s had died down from the main page I clicked on a story… Like a child at a fireworks display my ooh’s and arrr’s returned. 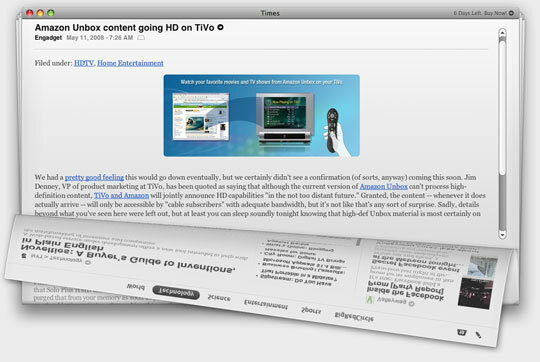 Times uses OSX’s Core Animation to literally peel back the page and reveal the whole story. It felt as natural as flicking through a real newspaper. Well, as natural as a computer simulation of such an activity can be. When you fire up Times for the first time its filled with all of your common or garden feeds. Now this is where the magic happens – its fully customisable! Import all the feeds that you know and love directly from Mail or Safari. Or go it old school and add the url by hand. In this world of “everything for free on the internet” why would I pay? Yes Times is a desktop application that costs $30, or it did the last time I looked. This is the kind of money that I could be spending or an over hyped summer blockbuster DVD. Why should I deprive myself of such mediocre dialogue and high octane action? Google Reader can help me scoff through 200 bits of RSS shaped cake in less than 5 minutes. This is its beauty. This is also where the beauty stops. With Times I tend to read every story in every feed I subscribe to. I very rarely buy newspapers anymore, but if I am going on a long train journey I will buy a paper from the station and read it cover to cover. Times has this effect on me too. It gives me more of an experience. Not just a quick way to get info from all corners of the internet. Although this has its shortcomings. I don’t get any work done whilst I am digesting every morsel of today’s Lifehacker stories or finding out every single new (depressing) 3G iPhone rumour. What do I do now? Should I throw some hard earned cash at it and purchase RSS designer chic. Unfortunately no! Although I do love what they have done. Reading RSS feeds can be an experience too and Times makes it a very pleasant one. I still can’t take myself away from the wonders that is Google Reader. I have a small but active Google Reader friend base who share their stories. Times doesn’t come with a pre configured social network. When I get up in the morning I need to get my web designer hat on as quickly as possible, Google Reader is simply the most efficient way to do this. The last of nails to be put in this Times shaped coffin is that fact that I do a good percentage of my feed reading on my iPhone. I want my information everywhere, on any computer, any device. 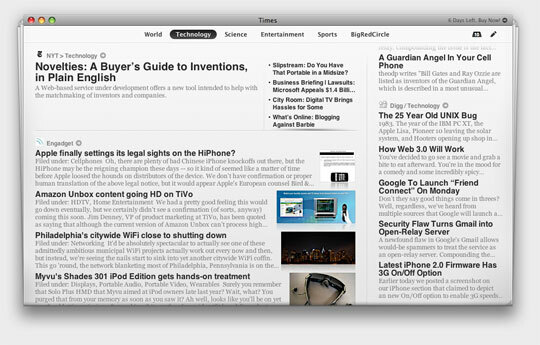 A desktop RSS reader is just not the way to go for this. This is not a problem with Times its a task that online RSS readers can simply do better. Check it out yourself, take a week to revel in the uber slick animation and see if you will switch. If Google Reader didn’t exists maybe I would be using Times right now. We wrote this 10 years, 11 months ago	(11/05/2008 : 12:40 pm) and filed it under Reviews. Google Reader? Get with the times (pun intended) and use Netvibes. Google Reader might enable you to read lots and lots and lots of feeds quickly in one place – but I’m a firm believer in quality over quantity. I have a dozen (or so) select sources of web/news/art/music feeds on my Netvibes which serve me well. That’s why I’m always sending you links (Davy!) and not vice versa.